- Fits practically any mountain bike, electric bike and city bike up to 29" wheel size. - It even fits scooters and certain motorbikes. - There's an elasticated band special designed at the bottom to help stabilizing the cover and all-round protection,so it fits round your bikes snugly. - The adjustable strap is long enough to pass easily under two frames secured by a strong looking snap-lock. Keeping your bike cleaner for much longer! You will receive a bicycle cover with a storage bag. Please MEASURE YOUR BIKE before purchase. 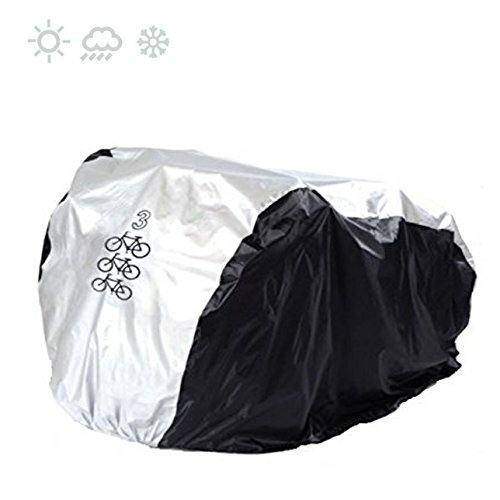 1: Is the cycle cover strong enough and suitable to protect your bikes outside all year round? - It is strong enough and suitable to protect your bikes outside cause the Heavy Duty nylon material and PU coating. - Elasticated front - middle - back hems and buckle on the middle to keep the cover in place during high winds. - It's big enough and has clips underneath to cover the bottom aswell. 2: Can the bike be secured with a lock when this cover is on it? - Yes there is no issues with securing this with a lock. - It can be easily locked with the cover on. It has a gap underneath and two lock-hole at the front wheel area provide security away from bike theft and bad weather. 3: Would this bag be suitable for use in travelling by bus? Will it fold to small package? -Yes, it will fold into a small package, this bag could be used for traveling on a bus, it comes complete with a small bag for storage, and folds easily. 【Bigger Size】Capacity: 3 bike,fits for mountain bike, electric bike and city bike up to 29" wheel size. Non-stretched dimensions: 200cm L x 105cm H x 110cm W ( 78.7L * 41.3W * 43.3H inches ).PLEASE MEASURE YOUR BIKE BEFORE ORDERING. 【Durable Protection】①Good quality 190T nylon and PU coating, thicker and more durable.②Silver part made from high-tech heat- reflective material,double-stitched hems with heat seamed sealing technology protects your bike and bike seat. 【Windproof Buckle Design】Special designed at the bottom to help stabilizing the cover,strap and buckle on the bottom keep the cover secure on windy days. 【Heavy Duty】Pepels water and 40+ UV resistant.Protects your bike against rain, snow, wind, dust, scratches and sun damage UV protection. 【PACK AND GO】Includes a bicycle cover with storage pouch.Convenient folding, saving space.